The Amazon yellow-footed tortoise (previously called Geochelone denticulate, presently Chelonoidis) is a genus of the group Testudinidae. This tortoise relates to the red-footed tortoise (C. carbonaria). We see them in South America in the Amazon Basins. These yellow-footed tortoises are the third biggest tortoises ever seen on the mainland; its normal length is 40 cm (15.75in) and its largest specimen recorded a size of 94 cm (37 inches) Only the African spurred tortoise, Geochelone-sulcata of the size of 76cm (30in) and the Asian forest tortoise Manouriaemys emails 60cm (23.6in) are bigger. The carapace (shell top) is elongated and oval in shape with parallel sides, its posterior is high-domed usually flat along the backbone (scutes or shell scales along the top of the carapace) it has a slightly pointed end at the rear. The gulars (front pair of plastron scutes) do not protrude from the carapace; the plastron (shell button) is yellow-brown, its edge is thick all around and more or less black in color. There is a difference of opinion on the ideal type of habitat meant for the yellow-footed tortoises. A few people consider that dry forest regions and grasslands are preferable, and a rainforest habitation is secondary. Still other people advocate humid forest type. Despite these consequences, you find them in dry forest regions, savanna, as well as grasslands if not in the open regions bordering the rainforest belts. In the pet trade you find the yellow-footed tortoise infrequent even though not rare. The hatched Yellow-footed tortoises in confinement are the finest pet tortoises. They have a personal touch and are quite easy to breed. When compared to the other varieties of tortoises, the yellow-footed tortoise is quite big in size, and they normally need a lot of space. If you have any idea of having a yellow-footed tortoise as a pet, make sure you have sufficient area for sheltering it properly. Apart from an indoor housing, if you want to keep them outdoors when the climate is warm, you must also have an outdoor enclosure. It is not advisable keeping the yellow-footed tortoise indoors all the time. A sufficiently large, locally made wooden cage is good. Temperature is an important aspect here. These yellow-footed tortoises in their normal habitat will not tolerate temperatures below 160C. Normal room temperature is fine, but ensure that it does not go very low at night. Perhaps humidity management is a criterion difficult to keep up, besides fresh keepers are likely to miss this. An ideal humidity for this tortoise is between 80-90%. Place a heat lamp at one corner of the enclosure for facilitating micro climates. For this purpose a 100w desk bulb is ideal. Maintain the temperature at 32°C under the heat bulb and for their requirement of sunlight, provide a UV light to help them produce vitamin D.
The yellow-footed tortoises are omnivorous reptiles. For sustaining their health and promoting their growth, give them a definite amount of meat or other animal food. Insects like termites and ants are part of a normal diet and earthworms are a good substitute that you can easily obtain. Earthworms are their favorite dish. Mice and prawns are good meat products. Mushrooms provide low-fat proteins. Yellow-footed tortoise enjoys consuming mushrooms. 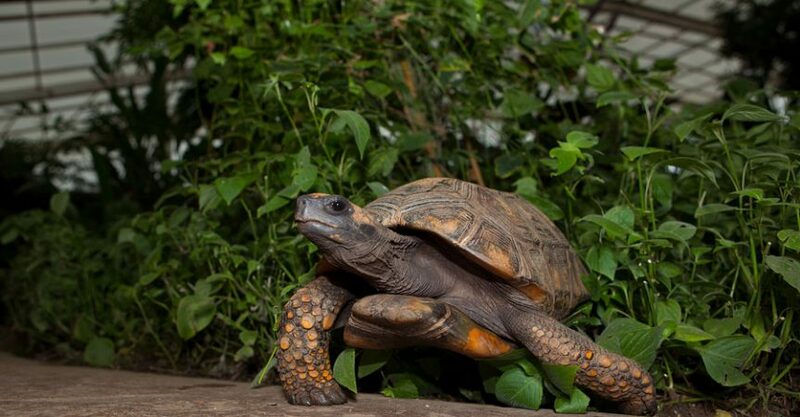 The Yellow-footed tortoise attains puberty at the age of 7 to 9. Some keepers state that July to September is the ideal time for mating, even though they mate anytime. 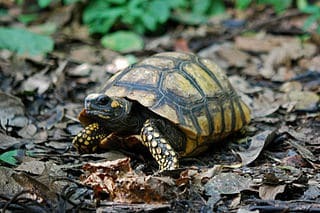 Breeding of the yellow-footed tortoises becomes faster in the mild cool winters followed by rain. Male tortoises are enthusiastic breeders and a healthy couple produces six to twelve eggs every season in two clutches, based on the female’s size. They lay these clutches in 4 to 6 week gap. These yellow-footed tortoises are introverts, and they dislike handling. 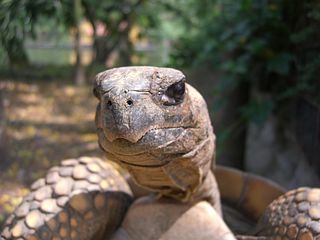 They often return to their shells and stay firmly covering their heads with their large scaly legs.